The Greater Blue Mountains Area is a sandstone plateau that holds a high diversity of eucalypts, representing all four existing groups. It is an area of rugged tablelands, sheer cliffs, deep, inaccessible valleys and swamps. The Area also contains ancient, relict species of global significance. The most famous of these is the recently discovered Wollemi pine, a 'living fossil' dating back to the age of the dinosaurs. The Blue Mountains had a tough time getting into the List. The site was deferred once, and the next year the IUCN advised deferral again. “We can’t have a WHS based solely on its eucalyptus trees, can we?” was their argument. And anyway, there are eucalyptus trees all over Australia, also in parks that are already WHS. The WH Committee thought otherwise, possibly helped a little by the fact that Australia (Cairns) was hosting the Meeting that year. And after promising that it would look after the eucalypti well, Australia was given its souvenir WHS. For my visit to this WHS I stayed for 2 nights in the town of Katoomba, the largest in the area and 2 hours away by train from Sydney Central. The town is all faded glory, reminding me of visits to the High Tatra in Slovakia or Rhine cruises in Germany. Tourism once was big here, but although I visited during the Easter school holidays most of the hotels/motels/b&b’s had ample rooms available. From Echo Point, the main viewing point over the valley, the surrounding mountains and the Three Sisters, I hiked down via the Giant Stairway. Like Ian reported below in his review, I did not find it tough although the walk is labelled as "hard". Over the past weeks I often experienced here in Australia that the signs are overstating the difficulty or the time that it will take to finish a particular hike. It's probably to deter the totally unprepared. At least I was wearing hiking boots and had a small bottle of water with me. Some people were coming up again while I was walking down - "too steep" they told me. Well, it's just a lot of stairs, even with handrails and benches to rest on. After 25 minutes I arrived at the Dardanelles Pass. This path is not at the bottom of the valley, but more on a ridge about half way. From there it's a flat walk to the spectacle of the Scenic Park. Those who do not like to walk can take the cable car here, or the little train which is in the Guiness Book of Records because it's the steepest railway in the world. I took the train back up again, the only passenger as most people like to do this rollercoaster ride downwards. As the forest is quite thick, I did not see much wildlife here. Mostly birds, among them the screaming Sulphur-crested Cockatoo (you hear them when you're walking down the Giant Stairway, it's as if you will enter a pit full of birds), the small Eastern Yellow Robin and big long-feathered birds which I guess are Superb Lyrebirds. What can I say about the Greater Blue Mountains? Well, they were there, tantalizingly shrouded in the fog when I visited in June of 2012. Eucalyptus trees lined the bluffs above the Jamison Valley on my hike from Echo Point to the famed Three Sisters rock formation, and a host of invisible birds announced their presence from the valley floor below. The Three Sisters revealed themselves at the last moment as an almost Avatar-like landscape of rock islands floating in the clouds, making the bridge crossing over the fog-covered chasm a rather surreal experience. Although I found the scenic viewpoints pretty useless during my visit, the experience of a natural wilderness revealing itself with each step into the unknown was pretty amazing. The Blue Mountains are only an hour or two west of Sydney, but they felt a world away, and I can only imagine what the park is like with better weather. The town of Katoomba, gateway to Echo Point and the Three Sisters, was pleasant and reason enough for me to return. And I'll have to make my way back if I ever have hope to see the vistas promised in all the travel literature. Logistics: The Greater Blue Mountains are approximately one to two hours west of Sydney, depending on traffic; there are many trails near the base town of Katoomba. I visited this WHS in January 2018. The inscribed name is quite misleading as in actual fact the Blue Mountains National Park is just one of the seven national parks that are inscribed within the Greater Blue Mountains Area. It is also the most visited as it is an easy half day or day trip from Sydney. That said you could easily spend whole days of hiking without meeting another soul even within the Blue Mountains National Park except from the obvious lookouts. 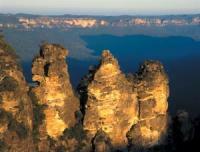 The most iconic and famous of these lookouts is Echo Point with the view of the Three Sisters (photo). Unlike, the Scenic Railway and Cable Car experience in Kuranda, the nearby Scenic World Cable Car is really a colossal tourist trap and you won't get any added value in terms of views or OUV. Moreover, all the tourist crowds and groups flock there like it's the main attraction. From Sydney, I took a train from St James Station to Katoomba Station. Then you can either take it easy (especially if you only want to visit Echo Point and some minor lookouts like Eagle Hawk Lookout) and catch the Explorer Hop On Hop Off Bus (for 44$) or else simply rely on the very efficient and cheap public transport to be able to cover more ground. Upon arrival at Katoomba station, I first headed towards the Blue Mountains Cultural Centre, which hosted Into the Blue, a very informative section dedicated to the Greater Blue Mountains Area WHS. The OUV of this WHS lies in the over 90 eucalypt species in temperate eucalypt forests, sandstone plateaus, escarpments and gorges. The area gets its name from the blue haze which is caused by sunlight and fine droplets of eucalypt oil from the trees, dispersed into the atmosphere. The best time to experience this phenomenon is at sunrise or sunset on clear days. Eucalypt trees have evolved over millions of years, reinventing themselves with every single new situation they were confronted with. That's why there are so many species of eucalypt trees. The heath on the clifftops appears to be pruned manually but in reality it is pruned by wind to a uniform height and provides cover to a variety of birds and small mammals. The highlight sightings were the Yellow-tailed Black Cockatoo, the Channel-billed Cuckoo and the iconic Superb Lyrebird which features on the Blue Mountains NP logo. 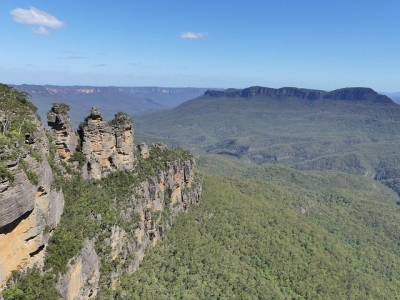 The second best lookout point and a very good starting point for different hiking trails is Govetts Leap Lookout near Blackheath which is easily reached by public transport from Katoomba. Here there's also the Blue Mountains Heritage Centre where you can also experience the Claustral Canyon with virtual reality glasses (10 dollars for a 15mins session). At Govetts Leap Lookout there's also a UNESCO WHS plaque just opposite the main marker. From here there's a spectacular view of the Blue Gum Forest and Grose Valley Creek. The easiest trails are Pulpit Rock Trail (2.5km) which leads to Bridal Veil Falls and the Cliff Top Track to Evans Lookout Trail (6km) which leads to Wentworth Falls. If you have a rental car or more time at hand, you can also reach the nearby inscribed Jenolan Caves by public transport. I grew up in Sydney and never really appreciated what a magnificent WHS was just an hour's drive away. The main road that goes through the mountains offers easy access to lots of walks and viewpoints. The most famous one is of the Three Sisters. Personally, though, I like to start there but do a long hike that takes you down into the valley and along the bottom of the cliffs, past waterfalls, and then back up further along. The Blue Mountains are the perfect location for a day trip from Sydney, especially if you love nature and forest, walking and hiking. I did such a day trip twice (in 2007 and in 2010) and both visits were great. A big plus is that the National Park can be reached and explored so easily by public transport, so you do not need a car at all. On my first trip, I had a look around the more touristy part of the region, seeing the three sisters, visiting Leura and Katoomba and doing just a short walk. On my second visit, I was much braver and did a long hike taking in many waterfalls and spectacular views. I hardly met any other hikers and really experienced nature at its best. It was a fantastic day and I am glad I did this second trip to enjoy a different side of this wonderful region of Australia! Over several I days I took hikes in different parts of the Blue Mountains accessible by train from Sydney Central. 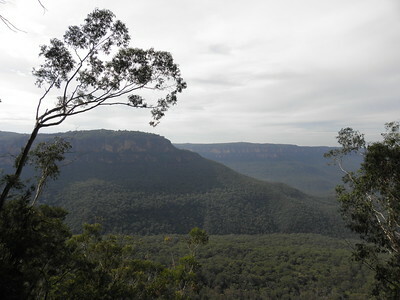 At Blackheath I hiked to Govett's Leap, then returned from there by bus direct to Katoomba. At Wentworth Falls I hiked to the edge of the Jamieson Valley, and similarly caught a bus from nearby to Katoomba. At Katoomba I took a hop-on hop-off trolley and got off at several locations for short hikes. 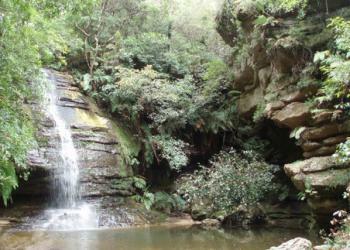 The most rewarding stops I found were at the Leura Cascades, Gordon Falls and Echo Point. Apart from the amazing views at each stop, there were continuous views of the scenery from the train between Glenbrook and Mount Victoria. When you do go to the Blue Mountains - be prepared! the best thing to do is travel by car - as I recommend Blackheath - Evans Lookout as a good introduction - nice and easy walk. It is important to note the flora along the way - which includes the waratahs (Telopea speciossima) - best to see in early October and very rare Christmas bells (Blandfordia cunninghamii)- which is a real treat to see around January. Other great plants to note is the Persoonia chamaepitys - along the track and the Isopogon fletcheri. Bird enthusiasts will also be well impressed - especially by the lyre bird, and Gang Gang Cockatoo, Falcons, cuckoo and owls. There is always something to see, hear and explore! From Sydney, I took a trip to the Blue Mountains, as well as the nearby Jenolan Caves. 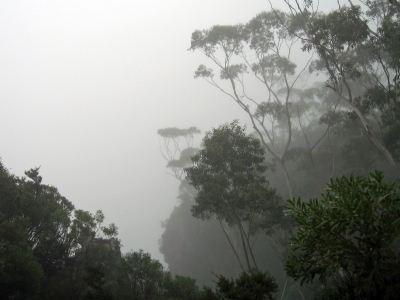 The Blue Mountains have a blue hue that comes from the eucalyptus trees. I had fun riding the Katoomba Scenic Railway, "the steepest incline railway in the world." There were beautiful crimson rosellas everywhere. The side trip to the caves were fine but skip it if you're pressed for time. I have been t0 the Blue Mountains twice. Both times a wonderful experience. I would suggest rental a car to drive up there as you will be able to explore more secluded scenic spots. Australia's tourist facilities are top notch... no doubt about it. The Blue Mountains provide a great break from Sydney, and it really does not take long to get out to them. It was about two hours if I remember correctly from Sydney to Katoomba, which is a nice place to make a base. It has a kind of faded art deco chic going on. This is where you can see the some of the more famous parts of the mountains such as the "Three Sisters" rock formations. It is also a good location from which you can also descend to the valley floor in a number of different ways. I decided to do hike down the steps, which was particularly rewarding. It was not as tiring as I thought it would be and is well worth a couple of hours. Also fun is the railway which is a bit more like a rollercoaster as it descends at and angle of up to 45* making it one of the steepest in the world. We got talking to the driver and he let us travel up and down a few times for free. I was also able to spend a day just off hiking and horse riding (not normally my favourite things) and quite enjoyed it. Although these are not really what I imagined mountains to look like, they are well worth at least a day trip if you have the time from Sydney. I came to the Blue Mountains on a day trip from Sydney and in hindsight I wish I had more time. Wentworth Falls, a town before more visited Katoomba, is worth the stop. It is a short hike to get to the overlook but the panorama is not to be missed--there's no doubting you're in Australia here. 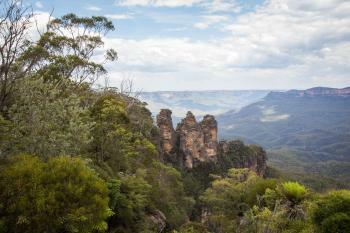 Of course the Three Sisters, the iconic rocky pinnacles of the area, shouldn't be missed either. The hike down to the base of the nearest one is a good way to get perspective on the valley. I have only been to the Blue Mountains on a daytrip from Sydney, but I agree that this area is really beautiful (unless you get caught in one of the evidently commonplace bushfires...) and probably the best daytrip out of Sydney that one can make. On the surface, the Blue Mountains look like your average European hill chain - the term "mountains" gives them too much credit -, but their flora and fauna make them unique and fascinating, and I believe the rare flora was one of the main reasons the site was inscribed on the WH list. Nice hikes and quaint villages, too, although I think the place can get crowded on weekends. I used to live in the Blue Mountains, I pretty much grew up there.I since moved to another part of australia that is hours away from the Blue Mountains and i just wanna say this.It is the most gorgeous place in the world and its my biggest regret that i had to leave. I count down the days when I can see it again.To all you mountain goats, dont do what i did and leave. Its the stupidest thing I did.But at the same time, when I lived there it really used to piss me off when I saw all these people move up there and cut down all the bush just so they could build an ugly great mansion! no offence, but you guys are crap! your not doing any favours for the area! surely you want your kids to see the mountains as you saw it! not like another Sydney!! Also another thing I miss heaps about the mountains is how laid back and non judgemental people were, especially in Katoomba. So all up i'll just say one more thing, if u are going to visit or move to the mountains think about the environment! As I lived in the area for years I had many chances to explore the Blue Mountains. Pack your hiking boots, food and drink and don't underestimate the distances!!!!! Be prepared. There are many, many hiking trails and camp sites (free) and maps are easy to come by. The Blue Mountains are an exhilirating, mind boggling, soul soothing experience if you are willing to do just a little walking. And yes, do go in winter because the heat in summer can be oppressing and the valleys might be inaccessible due to the fire danger. Lazarus species: Wollemi Pine: a species previously known only from fossils from 2 to 90 million years old representing a new genus of Araucariaceae, was discovered in 1994. Biological Corridor: part of the "Great Eastern Ranges Initiative"
Canyons: Capertee Valley, "the world's second largest canyon"
Situated on a Continental Divide: Part of the Great Dividing Range which drains eastwards to the Tasman Sea (Pacific Ocean) and south-westwards through the Murray-Darling basin to the Great Australian Bight (Indian Ocean). Secret Locations: Eagle's Reach Cave - "The location of Eagles Reach is being withheld to avoid it being damaged." Coal Mining: "Coal mining, formerly occurred in parts of Blue Mountains National Park (several major features are the result of cliff collapses). One of the popular visitor attractions is a relic of coal mining - the Scenic Railway at Katoomba. Much of this mining was long ago (late 19th and early 20th century) and is now regarded as a part of the cultural heritage of the area. Nevertheless, the coal mining did impact on the catchments of both the Nepean and Grose catchments of the nominated area" (AB eval). Nearby "Ruined Castle" within the NP boundary has the remains of a Coal Mine. 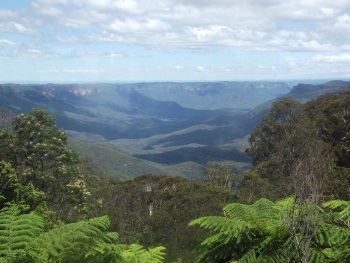 Charles Darwin: 17 Jan 1836 - On a visit to the Blue Mountains from Sydney "At lunchtime they had reached Wentworth Falls and, leaving the horses at the Weatherboard inn, walked southward two kilometres along Jamison Creek". Darwin wrote "An immense gulf is suddenly & without any preparation seen through the trees ... The class of view was to me quite novel & extremely magnificent." The track to the falls is now named "Darwin's Walk". Darwin ruminated on the geology but "the Blue Mountains deceived him, and he incorrectly arrived at the conclusion that they their vast ravines and valleys were due to an ancient inland sea carving them out. He thought that effects from rainfall would be negligible as it would have taken too long to create these spectacular effects. Darwin's most dangerous flaw with respect to his hypotheses concerning Australia, was that he was still badly underestimating the age of the continent." 250 Community Members have visited.